If there’s one item from Anthropologie I’ve consistently drooled over, it’s the Flamenco Shower Curtain. One day it will be mine. Strangely enough, in the last few weeks I’ve received emails from 3 separate readers all with it proudly showcased in their bathrooms. Now I want the darn thing more than ever! I think if I had it though I’d end up wearing it around the house! Do any more of you out there have this jaw-dropping beauty?? I love that shower curtain! It's so beautiful and fun!!! OMgosh that is beautiful. I love the slow grad colors. 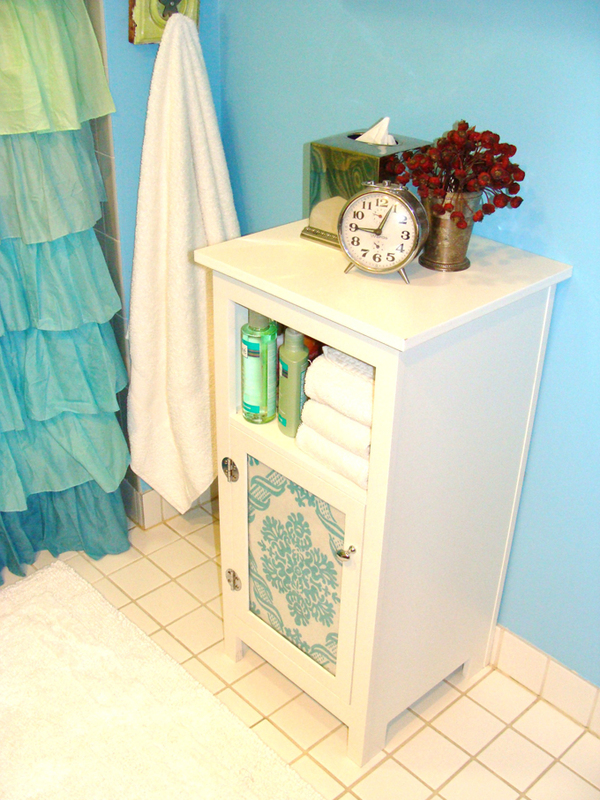 Turquoise is a color I am considering in my bedroom and your blog wonderfully showcases it. Ha ha! That would be quite the dress! It's beautiful! 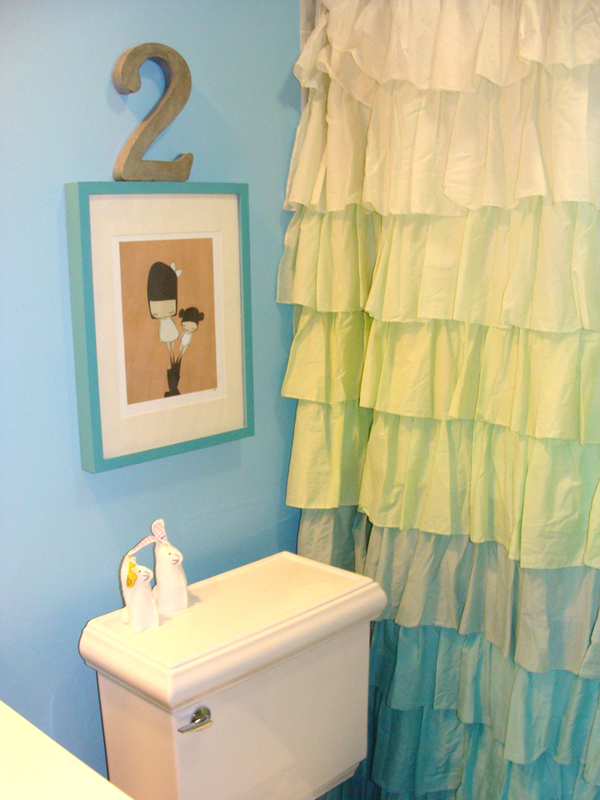 I love that graduated ruffled shower curtain. Erin it is adorable!! Love it! I really can understand you! 🙂 I just thought I'd mention it, because the apron is, well, TURQUOISE! I love the layers and flow of colors – so pretty! love it. i've been eyeing that shower curtain. and, I know this is a blog about turquoise, but the violet/coral colorway is gorgeous, too!! I LOVE this! You definitely deserve the splurge! I love it! I really love it! Looks terrific!! I actually just got this from my parents for my birthday (because there's no way I could afford it on my meager salary, otherwise). I. Love. It. It makes my teeny tiny apartment bathroom tolerable. This bathroom is so much fun! I would love to wake up to this cherry bathroom! What I wouldn't give for someone to create futon covers that were as exciting as shower curtains. I love that shower curtain. Maybe I should buy two and sew them together? oh bloody hell that is cute! I love that shower curtain and bought it for my teenage girls' bathroom. We already had turquoise accessories to go with from our previous shower curtain. Anthropologie rocks! P.S. It is so darn cute that this shower curtain even comes in its own ruffled bag. I have the bag and have been trying to figure out how I can use it. Any suggestions? If you have moderate sewing skills, this shower curtain could be made. I have made one before and the hardest part was matching the repeat on the fabric. That would not be an issue on this one though. I have wanted this one (and the white one) for a while now. That Shower Curtain Rocks! 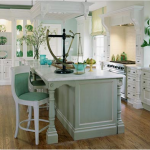 Love the different paint colors! Hi, Erin! 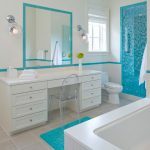 I just love turquoise since I got to know your blog. 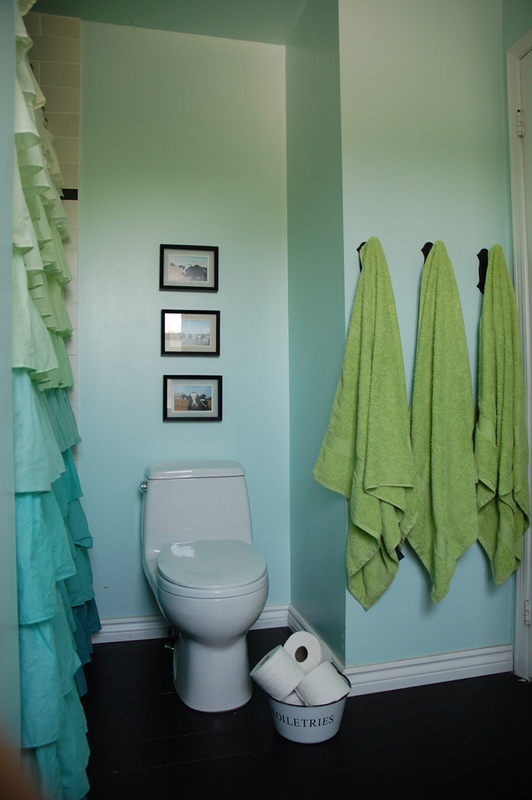 You know, even this shower curtain looks good in that color. Thank you for the lovely post!! Bela. It's in my guest bathroom! It makes me happy. I fell in love with this shower curtain last spring, although wasn't willing to pay the small fortune for it. 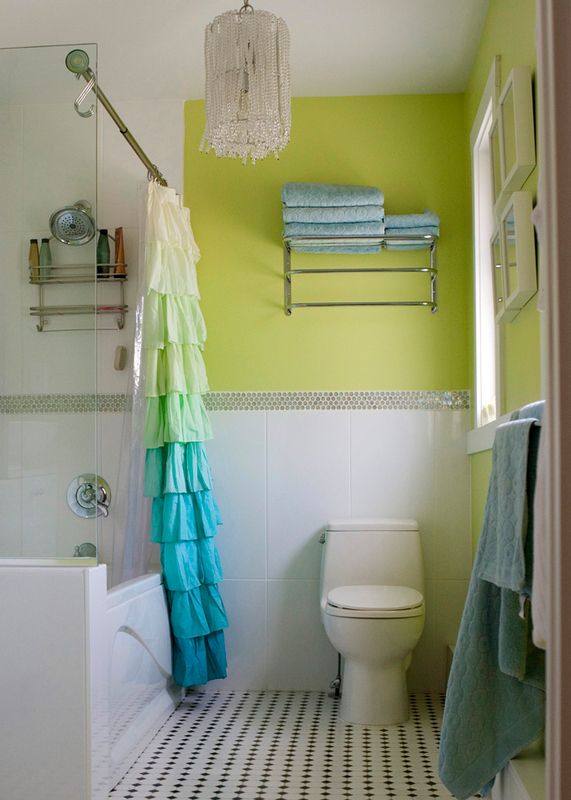 My aunt found out and made one in colors that matched my guest bath – it's white at the top and fades into yellow. She said it wasn't hard at all and didn't cost more than $20 in supplies. Oh! I love this shower curtain! I probably check twice a week to see if it's ever going on sale. Plus, that bathroom is adorable! me enamore!!!!!! l get in love with that courtain!!!!! super fantastic!!!!!!!!! !besosssssss erin!!!! 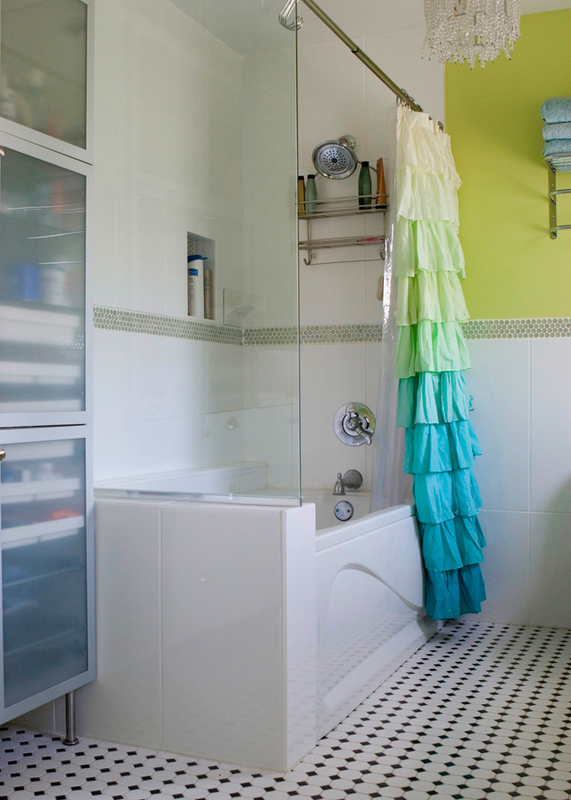 I L O V E that shower curtain…and funny that they have the #2 over the potty. Don't have one. Want one. Love these bathrooms! Do you know where the person in second photograph got their towel bar from. If you google "hotel towel rack" there's a bunch, but I'll email her and ask specifically! Ok she said she got at at Linens'n'Things a few years ago, but this one at Target is just like it! you are awesome!Thank you sooooo much!!!! I'm going to pick mine up right now!! Send you a picture later.. I love this and I just ordered the fabric to make my own, so I will keep you posted. So far materials are only costing about $25. 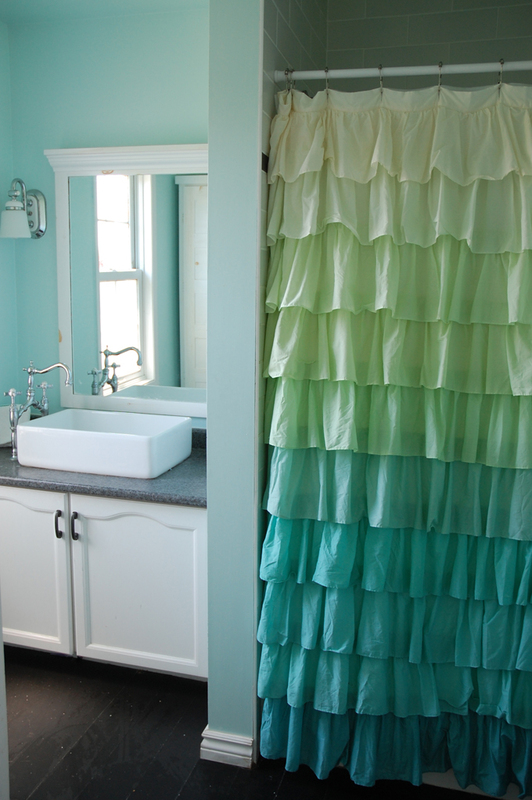 Erin, I am not even a frilly girl but I LOVE this shower curtain! A fun, unexpected element. Almost like a pretty dress hung casually after a fun evening out. First time I see it (I most have been snoring under a rock). Get it! I am always in for a treat when I visit here. You never let your readers down. Wow, that's a great shower curtain! My boring bathroom could definitely use some spicing up… My plain old blue shower curtain (which is greatly faded) just isn't cutting it anymore. Maybe I'll have to get this!